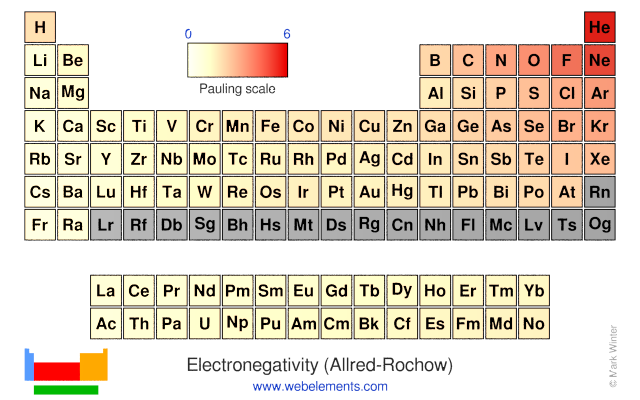 Image showing periodicity of the chemical elements for electronegativity (Allred-Rochow) in a periodic table cityscape style. 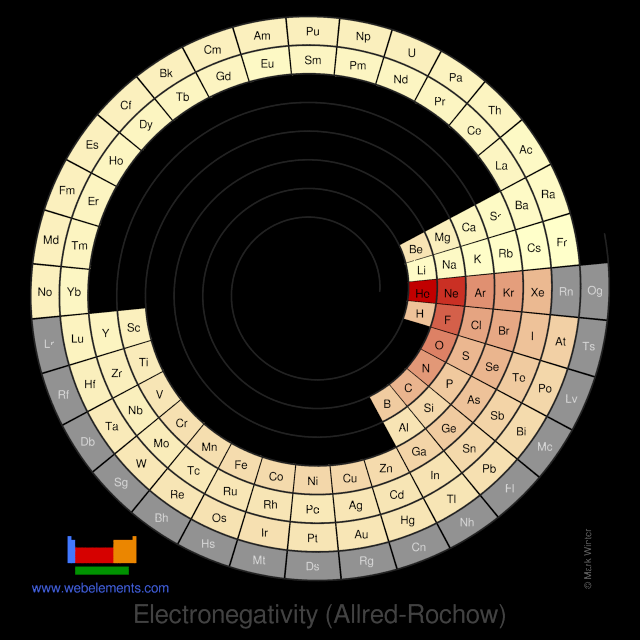 Image showing periodicity of the chemical elements for electronegativity (Allred-Rochow) in a periodic table heatscape style. Image showing periodicity of the chemical elements for electronegativity (Allred-Rochow) in a spiral periodic table heatscape style. 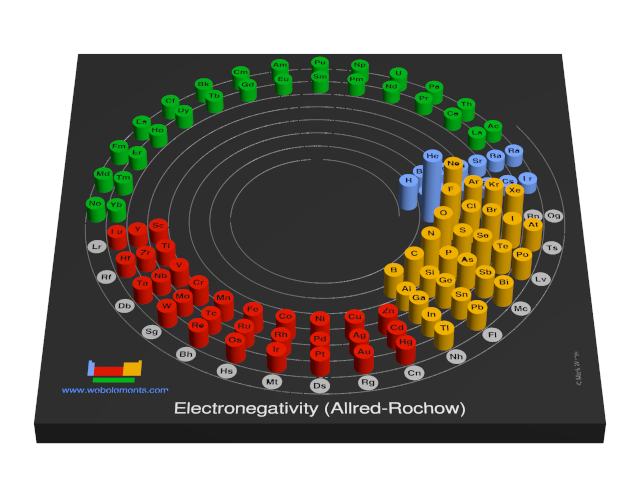 Image showing periodicity of the chemical elements for electronegativity (Allred-Rochow) in a 3D spiral periodic table column style. 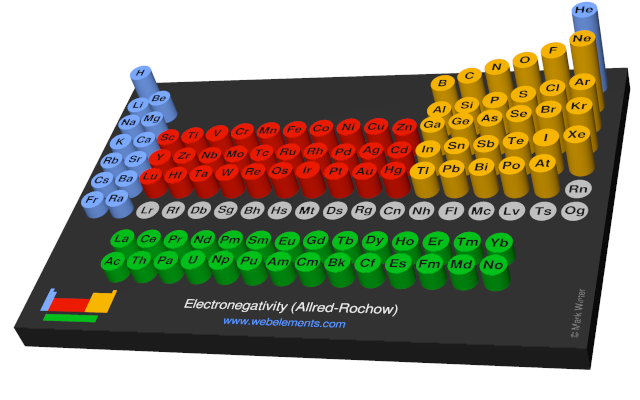 Image showing periodicity of the chemical elements for electronegativity (Allred-Rochow) in a 3D periodic table column style. Most values are taken from reference 1. Additional values for elements 40-46 and 58 onwards are contained within reference 2. Values for elements 95-102 are estimates. Values for Group 18 elements are taken from reference 3. Essentially similar data for Allred-Rochow electronegativities are given in references 4 and 5, as well as many text books. A.L. Allred and E.G. Rochow, J. Inorg. Nucl. Chem., 1958, 5, 264. E.J. Little and M.M. Jones, J. Chem. Ed., 1960, 37, 231.